The Lotus Carlton is a legend and the kind of car that comes along once in a generation. At a time when really fast four-door saloons were the preserve of BMW and Mercedes, this Vauxhall (Opel) derived super saloon arrived on the scene demolishing the opposition. Oddly, it wasn't its huge performance or masculine good looks that created the most fuss but the fact that the Daily Mail was so outraged by its stated top speed of 176mph, that it declared it too fast for British roads. Of course, the Lotus Carlton - or Type 104 to Lotus aficionados - was nothing of the sort, and although it shared its major components with a mainstream executive car, its level of development across every aspect of automotive dynamics had resulted in a truly special performance car. It was powered by a twin-turbo version of the venerable straight-six used in the Senator, which developed a remarkable 377bhp. To achieve that figure, Lotus had put a lot of work into the 3.6-litre power unit, uprating and strengthening the bottom end, porting the 24-valve cylinder head (from the Carlton GSI), and fitting forged 'slipper pistons' made by Mahle atop new Lotus-designed connecting rods tied to a counterweighted, forged steel crankshaft. The gearbox was the same six-speeder used in the Corvette ZR-1, the only transmission in GM's parts bin, capable of handling the car's monster torque. AP Group-C derived brakes - four-pot calipers with 330mm ventilated discs at the front and two-pot at the rear – sat behind specially developed Goodyear tyres. Performance was brisk, to say the least. 0-60mph came up in 5.0 seconds, 0-100 was dispatched in 11.1 seconds, and in 1992 Autocar Magazine recorded a time of 17.0 seconds for their 0-100-0 challenge, 2nd best behind an F40, however, it's the car's maximum speed of 176mph that will always be quoted by its fans. Dating from 1992, this lovely example has been enjoyed by just three owners and has covered only 42,000 miles in that period. Its first keeper appears to have been the Managing Director of the Lotus main dealer that originally supplied the car and subsequently it became the property of Simon Dickie the owner of the Pod Shoe brand. Our vendor purchased the Carlton in February 2002 with the mileage around 30,000. He has since used it lightly and in fact, it was on SORN for 6 of his 17-year ownership. The MoT history shows that the car had covered 33,573 miles in 2005 and at the time of consignment was indicating 41,960, only just over 8,000 miles in 14 years. Even without these numbers it's obvious that the car has been cherished, the Imperial Green paintwork retains a deep shine and the ruched Anthracite leather looks almost unmarked. The five-spoke alloys are excellent and the engine bay is a delight. Apart from routine maintenance and regular servicing, the car is untouched with the exception of the addition of a stainless steel replica cat back exhaust system. There are a number of service invoices and older MoT Certificates in the history file and the Owner's Manual and Service Book are with the car. All in all, this is an original and unmolested example of these very collectable 'super saloons' and, in this remarkable condition, would be an asset to any collection. The Race Retro Classic Car Sale will take place at the Race Retro International Historic Motorsport Show 2019 at Stoneleigh Park, Coventry, CV8 2LG (map/directions). 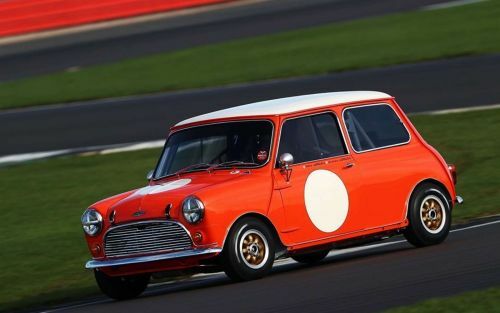 To access the auction without visiting Race Retro, please register your details via this link : https://www.silverstoneauctions.com/on-site-bidder-registration/auction/56 and then on the day enter the event via gate 1 only. IMPORTANT NOTE : Silverstone Auctions customers are directed to enter through gate 1 only. All guests are required to register for the auction via this link : https://www.silverstoneauctions.com/on-site-bidder-registration/auction/56 and entrance to the auction will be by catalogue only (£15 on the door). Should you also wish to attend the Race Retro event, tickets can be purchased from raceretro.com. For further information about The Race Retro Classic Car Sale, contact Silverstone Auctions on +44 (0)1926 691 141.